EuroPapi brings the stylish custom designs of Rolando Ortiz to Laguna Beach! If you ride motorcycles, dream of riding motorcycles, or simply love the fashion- come check out EuroPapi for Laguna Beach motorcycle clothing and accessories. The EuroPapi and EuroMami clothing lines are an infusion of motorcycles, scooters, skating & surfing culture, all in one. 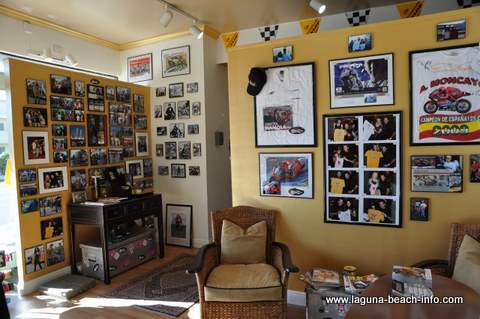 With distributors throughout Europe, the Laguna Beach store is the first shop to introduce Europapi's creative designs to riders in the U.S.
EuroPapi has had booths at the Spain MotoGP and participated in Laguna Seca on July 25th, 2010. 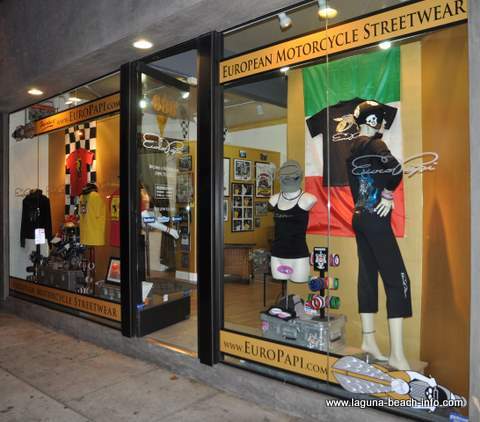 EuroPapi is located right on Coast Highway and during most times of the year, there is adequate metered parking along the street so you can park right in front of the store making it easier for you to get to this Laguna Beach motorcycle clothing and fashion store!